Using an iPod when the exclusive cable is connected to the multimedia terminal inside the console on the right hand side of the driver's seat. When the iPod is connected, the 'iPod' icon will be displayed on the top left corner of the display screen. Press the [TRACK ] button for less than 0.8 second to play from the beginning of the song currently played. Press the button for less than 0.8 second and press it again within 1 seconds to move and play the previous track. Press the [SEEK ] button for less than 0.8 second to move to the next track. Press the button for less than 0.8 second to activate or deactivate the random playback of the songs within the current category. Press the button for longer than 0.8 second to randomly play all songs in the entire album of the iPod. Press the button once again to cancel the mode. Repeats the song currently played. If iPod is connected, it switches to the iPod mode from the CD mode to play the song files stored in the iPod. 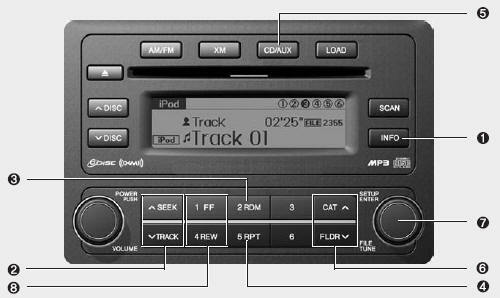 If no CD and auxiliary device is connected, it displays "No Media" for 3 seconds and returns to the previous mode. Moves to the upper category from currentlyplayed category of the iPod. To move to the category displayed, press SEARCH/ENTER knob. You will be able to search through the lower category of the selected category. The order of iPod's category is SONG, ALBUMS, ARTISTS, GENRES, and iPod. When you turn the knob clockwise, it will display the songs(category) next to the song currently played(category in the same level). Also, when you turn the knob counterclockwise, it will display the songs(category) before the song currently played (category in the same level). If you want to listen to the song displayed in the song category, press the button, then it will skip to the selected song and play. • Push [FF] button for 0.8 second or longer to initiate high speed sound search of current song. • Push [REW] button for 0.8 second or longer to initiate reverse direction high speed sound search of current song. The order of search or playback of songs in the iPod can be different from the order searched in the audio system. An iPod may not operate normally on low battery. You need the power cable exclusive for an iPod in order to operate an iPod with the buttons on the audio system. The PC cable provided by Apple may cause a malfunction and do not use it for vehicle use. When connecting the device with an iPod cable, push in the jack fully to not to interfere with communication. • When adjusting the sound effects of an iPod and the audio system, the sound effects of both devices will overlap and might reduce or distort the quality of the sound. Deactivate (turn off) the equalizer function of an iPod when adjusting the audio system’s volume, and turn off the equalizer of the audio system when using the equalizer of an iPod. When the iPod cable is connected, the system can be switched to the AUX mode even without the iPod device and can cause noise. Disconnect the iPod cable when you are not using the iPod device. When the iPod is not used for the audio system, the iPod cable has to be separate from iPod devies. Origin display of iPod may not be displayed.